We have had a few thoughts about cycling calculations while riding our bicycle. And it seems that Colby have had similar ideas recently (comment previous post), so I guess it’s time to open an official discussion in a “formal” post. This post may be a bit of everything, but I will try to keep it clear and logic. 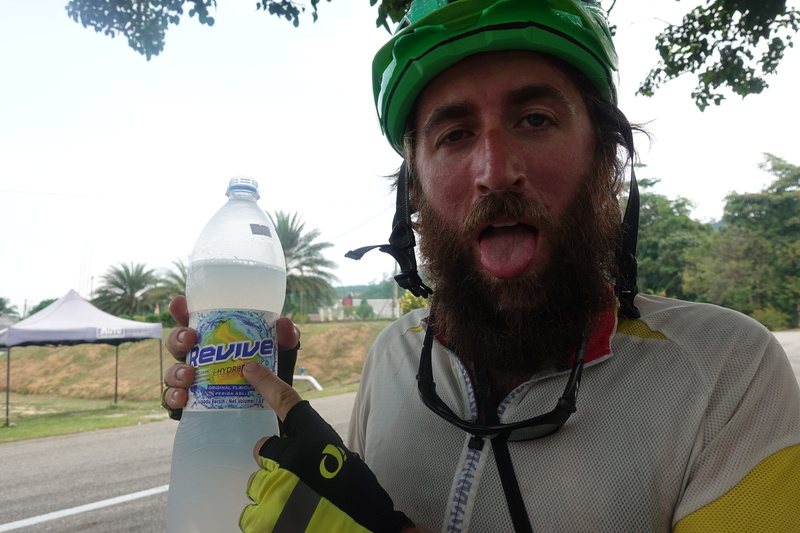 While biking in hot and humid weather, we also sometimes wonder if some secret ingredient in the magic potion would make the ride easier! We bike about 80km/day when the road is fairly flat (less than 500mD+/day), slightly less on hillier days (although we have done up to 100km and 1200mD+ some days, and 30km with 150mD+ on others…). We did not detail the cost of food in our expenses. It is currently about 300Bahts/day (about 10US$ or 8€ for two people in Thailand including snacks, multiple coffee breaks (with sugar and milk so it must be considered!) and 3 meals (always eating out 😊). Malaysia was probably slightly more expensive (15$ – 12€ / day), Australia and NZ probably around 30US$/day (NZ slightly more, Australia slightly less, almost never eating out – pasta are cheap though). We could take a more standardized food price, through the BigMac-Index (published by ‘The Economist’) – although there is a small bias given that McDonald’s is a bit of the crappiest place to eat in rich countries, and often a luxury eatery in poorer countries. That nevertheless gives a price for its 257kCal. For information, we would need to eat 39 BigMac to cover our calories (or about 1 BigMac every 2km! ), ridiculous (or Bob’s dream if he’s still reading)! Some alternatives could also be to buy some raw food products on commodities markets. Apart from being easier to calculate our budget globally without having to worry about the borders, that would possibly slightly become a boring culinary travel. Conclusion: Well, McDonald’s is definitely not a good idea, eating only shrimps either. Riding a scooter would be a cost saver (but we would be sad to no longer be able to try all sorts of food available in SE Asia!). Getting a diet based on raw sugar and palm oil (pretty much making your own Nutella) would short term save us a lot of money; however, we may have a larger medical bill at the end of the year (Dentist and heart doctors? Maybe even some case of that mysterious Kreislauf?). Also interesting is that although driving a small car is generally cheaper than cycling, the difference is not that large in Thailand where gas is quite expensive and food really cheap! That should be shorter, given that there is no fluctuation depending on the country! Conclusion: we win! We are more efficient than those stupid noisy stinky polluting fuel-engines (we’ve had a lot of time on the bike next to cars to form our opinion towards them 😊). Although I must concede that there is here another bias: producing food (i.e. also energy) requires a lot of energy (from the sun at one point or another, but often through a long food chain, and often with a lot of fossil fuels anyway…), producing fossil-fuels including distribution requires however a lot less of energy. But that would possibly be the start of a PhD (and we still want to win at the efficiency-rank)! Car: Going to a not-super-amazing viewpoint 20km away, sure! // Bicycle: meeeh, I’ve seen others! Car: Dropping all your luggage at a place for a week and doing day-trip from that place. // Bicycle: no way you bike back the same road! Let’s camp and do a loop instead! Car: I forgot to get some bread, let’s drive to the supermarket. // Bicycle: whatever, I still have a can of sardines! Car: If I take the highway, I can sleep-drive as long as I want // Bicycle: I’ve seen a sort of path going through the forest that does a shortcut, that probably goes through somehow! You are also very welcome to open the discussion and have any questionings like Colby for that one – that gives us a lot to think about and discuss while on the road! Great post! Have you been able to weigh yourself? That’d be the best determination if your caloric consumption requirements is correct. Well, the first idea of the blog was just to get a rough estimate – and compare particularly with small motorbikes, as those are super cheap here and consuming really little gas. – Our caloric estimate is given by a small GPS device, and does not measure anything on the body directly (heart, etc.). 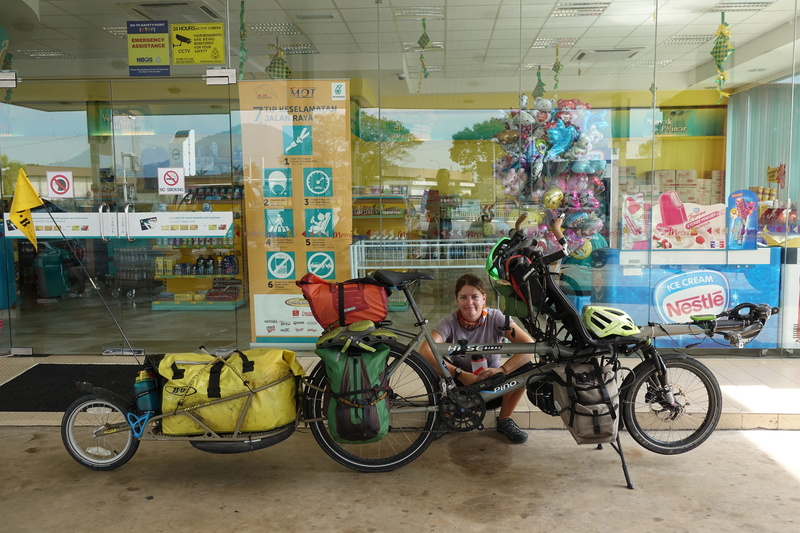 I have entered my weight in it, but it does not consider that we use a fully loaded touring bike (i.e. 90kg instead of a 8kg road bike!). We haven’t weighted ourselves recently (I usually almost never weight myself anyway, except when it’s the only way to get the weight of luggage before a flight! ), but we probably haven’t lost much in NZ/AUS (We however surely transformed fat into muscles! Does that need to be accounted to?). 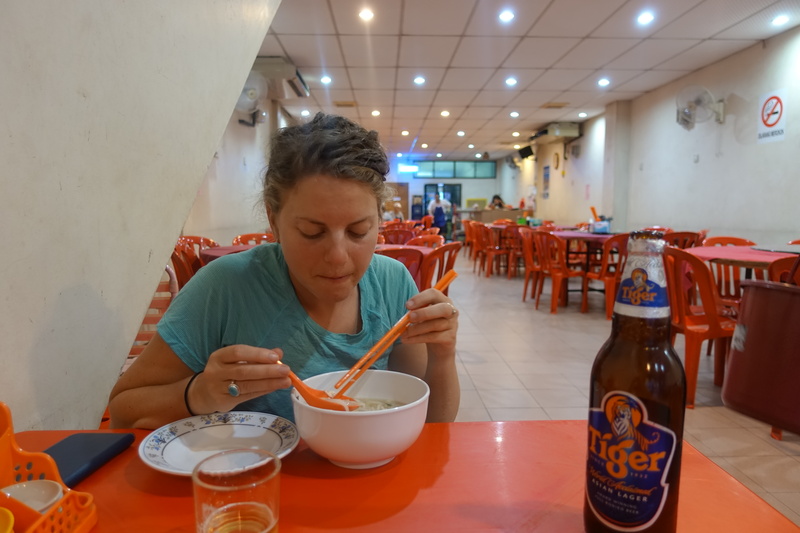 We may lose more in Asia though (the riding days are easier… but we are finding rice to not be very nutritive, and portions are pretty small). Cedric, and Cassie too – – truly the engineers living their dream (and that of many others)! Pondering this thought a bit more about types of ‘fuel’ and ‘various modes of transportation’ – I for one like all the pics of food ‘fuel’ that you two have been consuming while primarily on your ‘self powered’ mode of transportation. If you two were using another form of transportation, with an ICE (internal combustion engine), would you have taken as many pics of the ‘fuel stations’? Hmmmm – pics of fuel stations might get a bit boring . . . ‘Honey, let’s do a selfie in front of this BP station’ . . . or ‘We haven’t take a pic of a Gulf station yet, have we?’ . . . or ‘Do you think we have too many pics of these Petronas stations – let’s skip on posting another one of them’. Damn, I’m hungry . . . heading off for some pizza (I’m still on that ‘see food’ diet). . .bye for now . . . can’t wait to meet up with you! Enjoy! Your calculation may also miss the various fees triggered by maintenance of the bike (e.g. Tires, handlebar welding, chain, gears etc…). Driving a car would also be more incentive for visiting more and further thus extra cost. Yeah, cars are definitely not the greatest way to travel! 6- then when you feel it’s easing with downpour start cycling again to enjoying a colder air and a wet T-Shirt! 257kcal is actually for 100g of big Mac, but it’s 215g so yes 550kcal per burger. That makes it a little less impressive but cheaper… still not enough to compete with rice and noodles. I’ll have to update the post in a few days. You’ll have time, the laptop gave us the proverbial middle finger (not sure if it’s due to heat exhaustion or some tropical virus) a few days ago and we need to find a repair shop in Bangkok.